Images, top and bottom: Dawn Landes and Alex Steyermark set up in the Brooklyn Botanic Gardens; and The 78 Project creators Alex Steyermark and Lavinia Jones Wright check the Presto. Photo Credit: Sarah Law for The 78 Project. Director Alex Steyermark and Producer Lavinia Jones Wright in attendance! 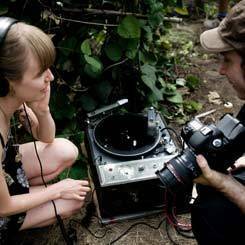 The 78 Project Movie is a documentary journey across America to make one-of-a-kind 78rpm records with musicians in their hometowns using a 1930s Presto direct-to-disc recorder. With one microphone. And one blank disc. In one 3-minute take--how America's authentic musical forms were originally captured. Along the way, a kaleidoscope of technologists, historians and craftsmen from every facet of field recording – Grammy-winning producers, 78 collectors, curators from the Library of Congress and Smithsonian – provide insights and history. 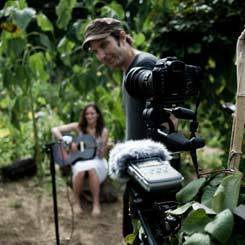 In Tennessee, Mississippi, California, Louisiana, the folk singers, punk rockers, Gospel and Cajun singers in the film share their lives through intimate performances, and find in that adventure a new connection to our cultural legacy. Alex Steyermark’s feature films, “Prey for Rock & Roll” (2003), “One Last Thing…” (2006), and “Losers Take All” (2013), with casts including Cynthia Nixon, Ethan Hawke, Gina Gershon, Michael Angarano and Wyclef Jean, have been acclaimed at US and International film festivals from Sundance to Toronto to Tribeca, and are distributed throughout the world. Steyermark started his filmmaking career as a documentary cameraman and editor. Prior to directing, he distinguished himself as a film music supervisor and music producer working with a wide array of recording artists (including David Bowie, Public Enemy, Michael Jackson, Dave Grohl and more) on films by Spike Lee, Ang Lee, Jonathan Demme and Robert Rodriguez, among many others. A Philadelphia native and current Brooklyn resident, Lavinia Jones Wright has documented and contributed to both the New York and Philadelphia music scenes extensively. Most recently, as a member of ASCAP’s marketing department, she wrote and edited words, audio and video for ASCAP’s Playback Magazine, website, award shows and ASCAP’s Field Recording web series and coordinated ASCAP’s Inside Music e-newsletter. As a journalist, Lavinia has contributed to Billboard, SPIN, WSJ Speakeasy, AOL Spinner, Harp, Magnet and Crawdaddy! among others. Both independently and with venues and promoters, Lavinia has organized concerts, festival shows and various events all along the east coast, most notably as a founding member of Philadelphia’s Freshout Media and as the founder of the Brooklyn Happenings. She has recorded and performed as a member of Adam Arcuragi and the Lupine Choral Society, the inventors of the Death Gospel genre.